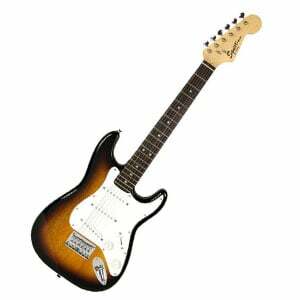 It is hardly a secret that Fender Stratocaster is one of the finest guitars in history of the instrument, and starting out your musical journey with one is not a bad choice at all. Strats are versatile, reliable, can cover just about any style from pop to heavy metal, and have those iconic looks. So if you happen to be looking for one of the best beginner guitar for kids, we bring you the Strat Mini from Squier, an affordable deal containing all the goods a young axe-wielder needs. Let’s see what this guy’s all about! The instrument utilizes a solid 3/4-size body crafted from basswood, combined with a small-scale C-shaped maple neck, a 22.75-inch scale length and a rosewood fingerboard with 20 frets and white dot markers. The build quality is generally sturdy and strong, while the looks are top-notch, giving the feel and vibe of the real deal. The sonic punch created by the mixture of basswood and maple reels in a classic bright Strat vibe. When combined with the electronics department – which we’ll discuss in a moment – the player is left with a solid sonic attach definitely worthy of every aspiring guitar master. In the electronic department, as very much expected, we are looking at the standard Strat pickup configuration of three single-coils and a five-way switch for tonal control. Apart from that, the manufacturer added a standard Volume control knob, as well as a single Tone knob to adjust the level of all frequencies. Further on up the road, on that standard Stratocaster headstock, the guitar features a set of six die-cast tuners that do a fine job in keeping the six-string in tune and in proper shape. Another factor worthy of pointing out are all the extra goods that come along with the guitar. Specifically, also included in the price is a guitar strap, a clip-on tuner, a set of picks, a cleaning cloth, and an instructional book for beginner guitarists. When it comes to the instrument’s sonic attack, we are dealing with a faithful replica of the classic Fender Strat, with budget cuts made at all the right places. Essentially, the tone is punchy, light and bright, with all the frequencies covered, warm basses and clear highs. Although we are looking at a thin tone compared to the read deal (a 10 times lower price, too), he clarity stands out as one of the top features of this instrument. Overall, for this price, you’ll be getting a great deal, a sound quality definitely on par with every beginner’s needs, and enough versatility to cover just about any genre you can think of. Seeing that kids tend to change their musical preferences in a blink of an eye, this is particularly useful if you ask us. Even without those mentioned extra goodies, this is a great bang for the buck. But seeing that the listed price will also provide you with a string of necessary guitar products, we really can’t find many better deals than this one. The sound is fit for beginners who like to cover a lot of musical ground, but still deeply rooted in traditional blues and rock values. One of the best guitars you can get your kid, that’s for sure! 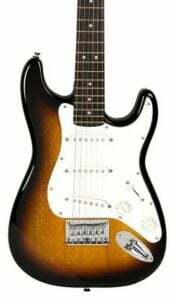 For more info about the Squier Strat Mini, click here.